PENTAGON — The U.S. Marine Corps has no plans for buys of the Joint Light Tactical Vehicle (JLTV) beyond the 5,500 to which the service has committed due to cost concerns around the Marines planned Amphibious Combat Vehicle (ACV), service officials said during Tuesday press briefing following the down select for the JLTV builder. Following the JLTV purchase and adoption, the service is set to begin procuring the long awaited ACV to replace the fleet of 1960s era AAVs to land Marines onshore from Navy amphibious warships. “At this point the affordability decision is to stand at 5,500 [JLTVs] but we’re always looking for future opportunities,” said Andrew Rodgers, U.S. Marine Corps, Program Manager, Light Tactical Vehicles during the briefing. The Army and Marines developed the JLTV program largely in a reaction to threats from improvised explosive devices in Iraq and Afghanistan that required not only adding weight to existing Humvees but also the scrambled purchase of billions of dollars in Mine-Resistant Ambush Protected vehicles (MRAP) which protected soldiers and Marines but were heavy, unwieldy and could not be transported by helicopter or amphibious vehicles. 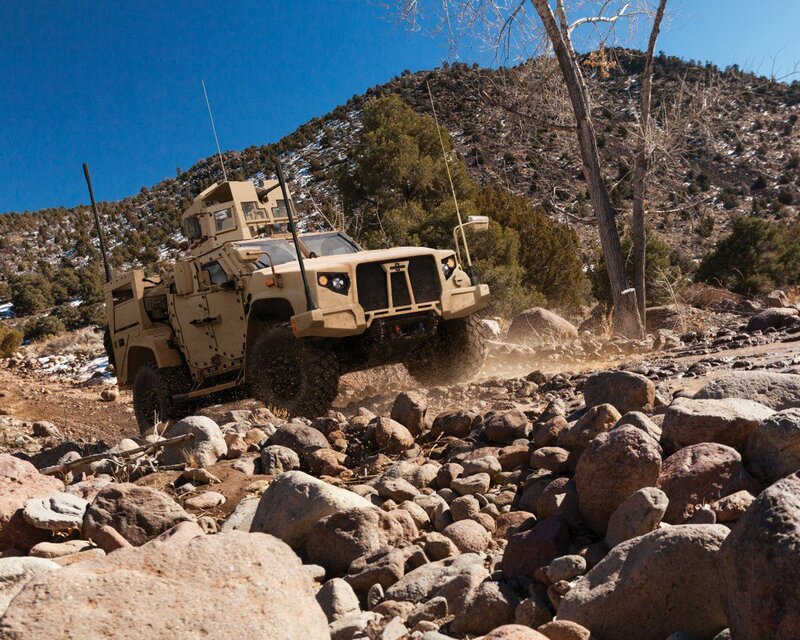 The promise of JLTV — awarded yesterday to Oshkosh Defense — is the same level of protection as an MRAP with the capability of transporting the vehicle via the Army’s CH-47s and the Marine’s CH-53 heavy lift helicopters. “This is going to allow us to operate in the way we envisioned our light tactical vehicles, being able to operate with greater flexibly and gaining back an expeditionary capability that we lost when we had to provide additional armament via a MRAP or a MATV,” said U.S. Army Col. John Cavedo, the former project manager for the JLTV. The shift for the Marines means replacing the 74 Humvees currently in its infantry battalions with 69 JLTVs. “The intent is to replace 5,500 vehicles that are most likely be in direct combat,” Col. Andrew Bianca, U.S. Marine Corps Deputy Program Executive Officer, Land Systems, said during the briefing. Now that the winner of the three way contest for the JLTV has been announced — Oshkosh Defense — the Marines will now work on how to integrate the vehicle on the U.S. Navy’s fleet of amphibious warships designed for the much smaller legacy Humvee. For example, the San Antonio-class (LPD-17) landing platform dock amphibious warship was designed to carry 5,500 pound Humvees not 14,000 to 15,000 pound JLTVs. “As you deploy out on a [Marine Expeditionary Unit], yes it’s not a one-for-one swap as far as space available on the ships. There is some additional [weight] growth but you also have an increase in protection, an increase in performance and an increase in payload to accompany that also,” Rodgers said.